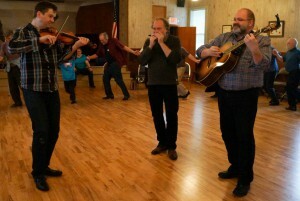 AND NOW IT’S TIME TO PLAY FOR A HARVEST FESTIVAL – IN NORTH DAKOTA! North America’s largest Scandinavian heritage festival will take place in Minot, North Dakota from September 28th and until October 1st 2016. Ten thousands of people travels every year to Minot to participate in this cornucopia of Scandinavian nostalgia, culture and proudness of family roots. I the four large halls that provides the frames for this festival, visitors will find formidable vikings, troll kings, Scandinavian as well as local crafts, Swedish meat balls, Norwegian heerings and Danish ‘medisterpølse’ and ‘Æbleskiver’. There will be stalls with Nordic knitting, costumes, Swedish clogs, Danish lego, cruises on sale, a young and slim Miss Norsk Høstfest, plus, of course, great American draws like Emmylou Harris, Chicago and Neil Sedaka. Furthermore the audience can experience the cosy atmosphere while lots of musicians from The US and Scandinavia – including Gangspil – Lydom, Bugge & Høirup, and our friends Skålmusik from Minnesota, entertains several times a day with a good mood and music and dancing from the old homelands. 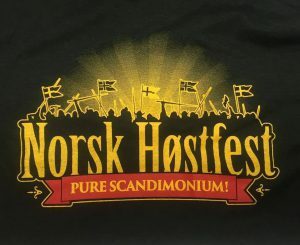 I was at Norsk Høstfest with fiddler Harald Haugaard many years ago, and it’s going to be fun to return with Sonnich Lydom and Kristian Bugge. On our way we might do a few gigs in Minnesota, Nebraska and South Dakota, but I’ll tell you more about that when I have news. 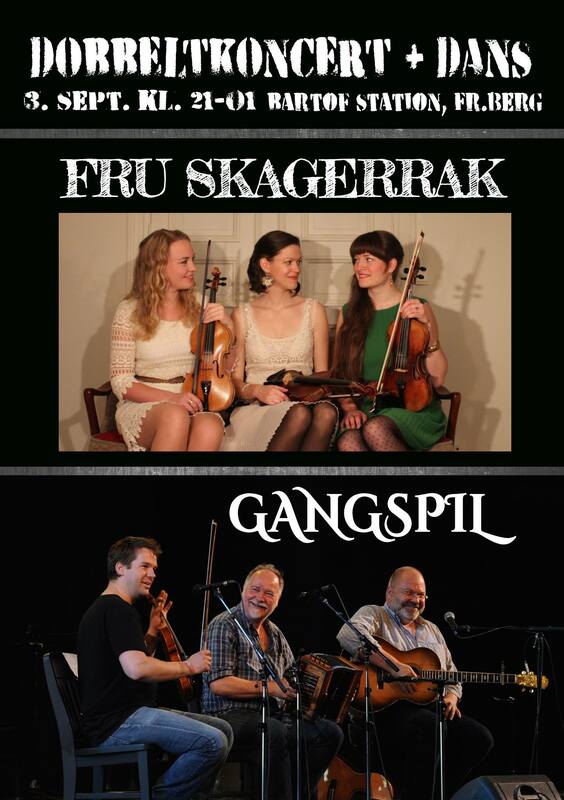 DOUBLE CONCERTO + DANCE WITH FRU SKAGERRAK AND GANGSPIL! On September 3rd at Bartof Station, Solbjergvej 3, 2000 Frederiksberg. Just across the Frederiksberg Metro Station. An evening with newly composed and traditional music and songs from Denmark, sweden and Norway, arranged for dance and concert! Entré 100 kr./ 50 kr. for people who are studying. LYDOM, BUGGE & HØIRUP ARE CHANGING OUR NAME TO “GANGSPIL”! BIRTHDAY AT MUSIK OVER PRÆSTØ FJORD FESTIVAL! Our little traveling duo, Lydom, Bugge & Høirup has been invited to perform at Musik over Præstø Fjord Festival on August 6th, which also happens to be the day that I turn 55 years old. 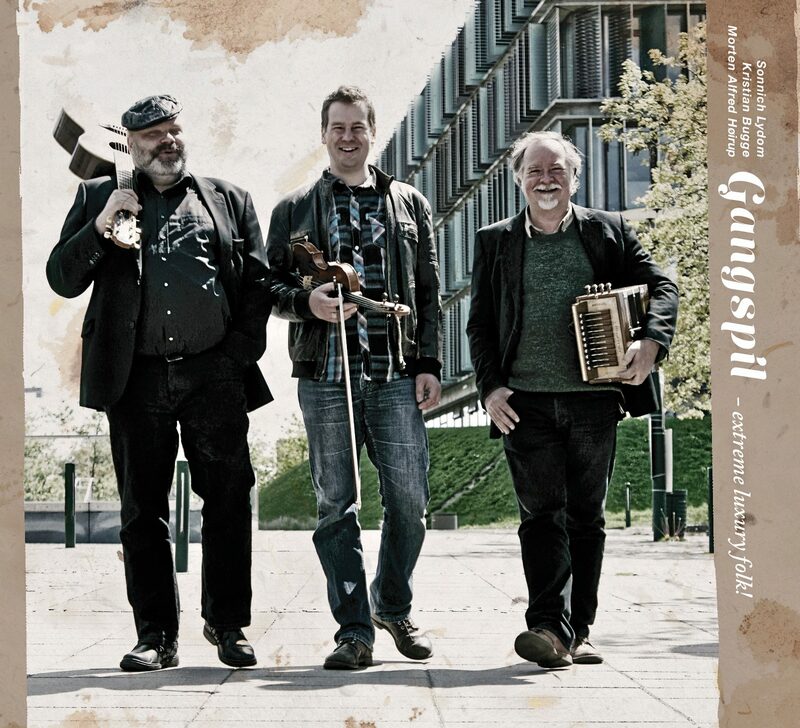 We will be on stage from 8:45 PM to 10:00 PM 20:45 til 22:00, – and the idea is that we’ll play music from our concert repertoire – traditional music from around Denmark, arranged for accordion, harmonica, violin and guitar that is – and then people will dance as they know best. As mentioned, I turn 55 that day, and I am really looking forward to meet colleagues, friends and acquaintances from near and far on the day. 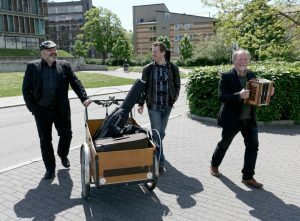 JENSEN & BUGGE + HØIRUP TO PERFORM AT MARIEHAVEN! Together with the duo Jensen & Bugge, I’ll perform at Mariehaven in Ansager, Jutland, on the 10th and 21st. of July. The 10th of July we will play our unique mix of new and old folk music, and the 21st of July, it’s all about playing for the dance – a new concept at Mariehaven. We have for quite a while worked on new arrangements that will work very well as concert music, but also as dance music. We love this concept, so do come and join us at Mariehaven. Check out the video from Højbystævnet 2015, where the Finnish bass player, Tapani Varis, joined us for a Danish Hopsa! HOME FOR THE LONG BRIGHT NIGHTS OF THE NORTH! “If I had wings, I would fly home with you, to the bright nights, please bring them all my greetings!” – From Hils fra mig derhjemme, a Danish emigrant song from 1922. Our trio, Lydom, Bugge & Høirup, are promoting our new album, Gangspil (Capstan, ande a few of our concerts was streamed on the internet, we were interviewed on a couple of radio stations, as well as promoted on a few news papers. 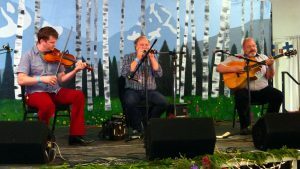 Our take on the traditional music of our home land was in fact received well by an enthusiastic audience, of whom quite a few had Scandinavian roots. Particularly inspiring was the visiting at Nisswa-Stämman in Nisswa, Minnesota, and the Scandinavian Midsummer Festival, Astoria Oregon. On both festivals the focus was on the music as a time machine and a unifying force. Children, youngsters and adults united in the dance and music, while given ample opportunity to speak about from where we come as emigrants, about who we are and what we have in common. A particularly good talking point was our version of the old emigrants song, Hils fra mig derhjemme (Greetings from me at home), that I sing using it’s original lyrics. 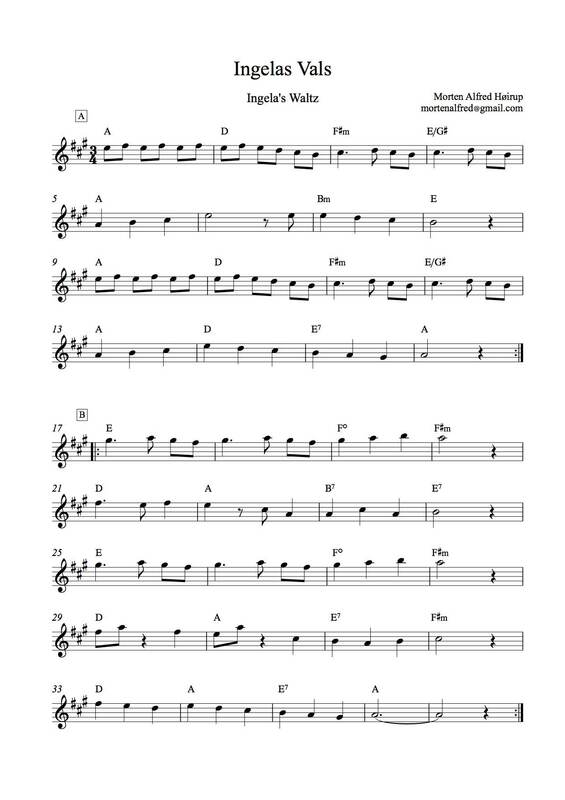 A lot of Americans with Scandinavian roots has either a close relation to this song, or they remember their parents or grand parents sing it with quiet voices and serious looking faces. From our version of the song many was taken with surprise that the song is actually Danish, and was sung the first time at Tivoli in 1922. The song about the Danish sailor, far from home, who is afraid of loosing connection to his people in the old land, hits directly into the heart of any emigrant, him or her being from Denmark, Syria or Iraq. The talks after the concerts was many and rich, and thy were a lot about the old land, about the ones who left home, and about the concern for the ones who stayed home. 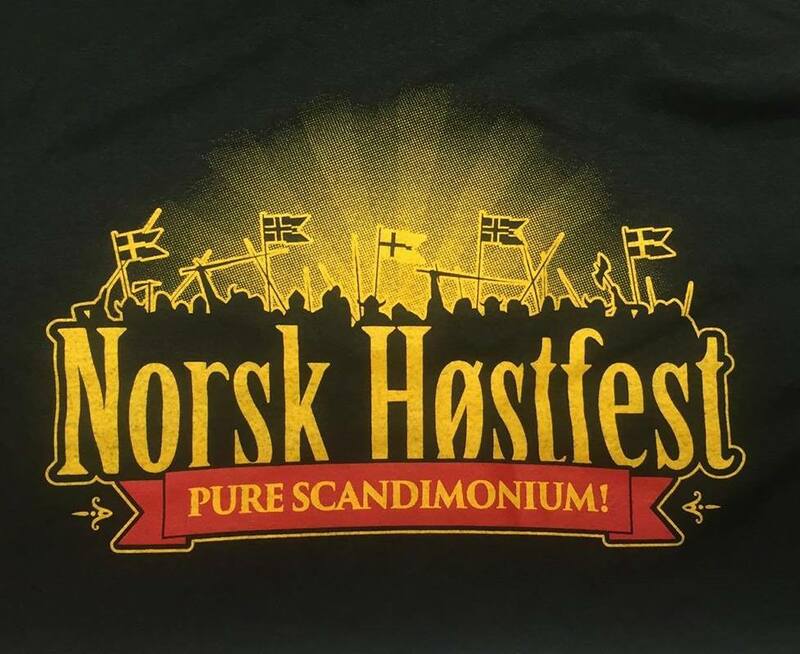 Sonnich Lydom (Two row accordion and harmonica), Kristian Bugge (Violin) og I myself will be returning to the US in the end of September, to perform at a huge emigrant festival called “Norsk Høstfest, in Minot, North Dakota. Here you will see about 80.000 people meet for about 5 days to celebrate their Scandinavian roots with a astonishing mix of music, dancing, traditional cooking, porcelain painting, cruises, knitting clubs, and much more. INGELA’S WALTZ IN NEW MUSIC COLLECTION DOWN UNDER! In 2008 I wrote Ingela’s Valtz, in memory of my wife, Ingela Ellen Marianne Eidorff, and it has been a huge pleasure to play it around the world with different bands ever since. 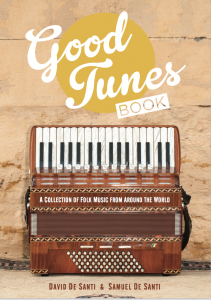 The Australian musician, composer and music activist, David De Santi, released the music collection, “Good Tunes Book – a collection of folk music from around the world”, together with his son, Samuel De Santi. 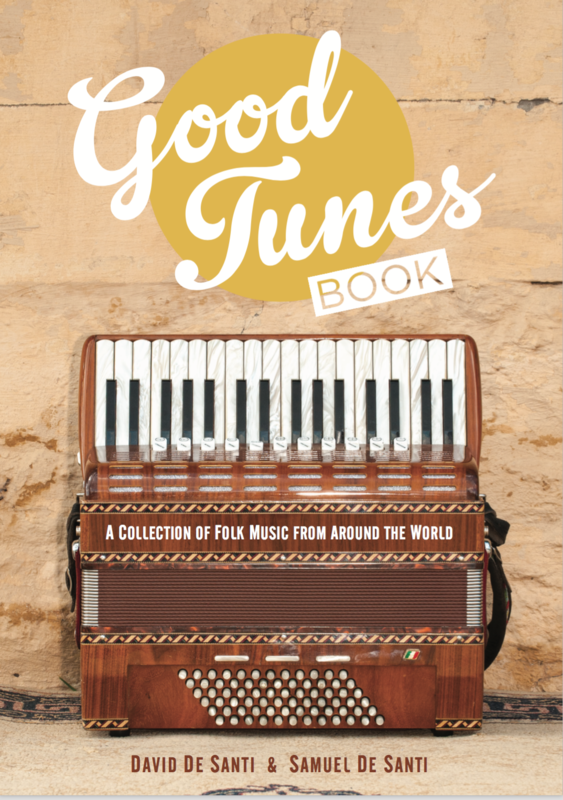 In this collection as one of the last tunes, you will Ingela’s Waltz noted next to, amongst others, Westphalia Waltz from Prince Edward’s Island, and the Scottish hit Dark Island. David has earlier released music collections music from Australia and Italy, and in this new collection, he and his son are focussing on the rest of the world. In this new and good looking music collection, which contains not less than 157 favorites, David and Samuel thanks Folkets Hus Spillefolk (www.spillefolk.dk) for use of their large music collection of Scandinavian music. 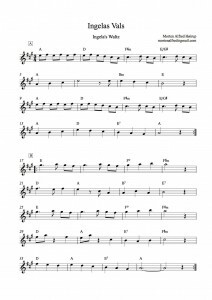 Finally a small hint for guitar players who want to work with Ingela’s Waltz in A major: It sounds great to play the tune in G major, with a capo on second fredge, which makes i A major, and that is actually how it was originally composed. Have fun! NICE REVIEW OF LYDOM, BUGGE & HØIRUP’S DEBUT ALBUM! In the new version of the international web magazin FolkWorld.eu, you’ll find a very nice review of our debut album, Gangspil (Capstan): “This is a broad view of the Danish tradition, full of interesting twists and turns, perfectly played and thoroughly enjoyable.” Read the full review here. SEE YOU AT SKAGEN FESTIVAL? My old dad, Fin Alfred, and I posing for the camera in a Danish May forest. 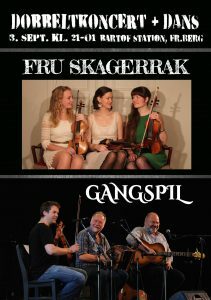 On the first weekend of July we will be on stage together, at the Skagen Festival. Photo: Carl Alfred. 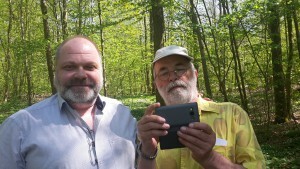 On the first weekend of July Fin Alfred and I will take the trip to Skagen Festival in the very North of Denmark. 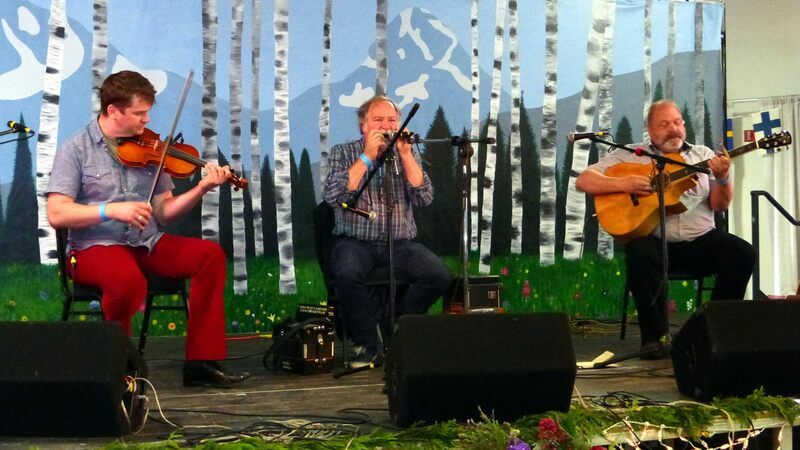 Fin will do a couple of concerts there, featuring a selection of his many songs, while playing the accordion. I’ll back him on the guitar, and sing along. We are very much looking forward to visit Skagen and to meet the many fans of songs and ballads that travel to this exciting festival every year. Fin Alfred has been singing and playing for more than 60 years, and in 2002 he went to Tønder in the very South of Denmark, to pick up a Danish Music Award (Danish “Grammy”), in the category “Danish Ballad Album of the Year”. We will be approaching Skagen with the car full of instruments, walking shoes, and cameras. Will we see you up there? 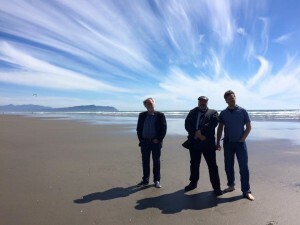 LYDOM, BUGGE & HØIRUP ON TOUR IN THE US! In June 2016 we’ll be back in The US with the trio of Sonnich Lydom (accordions and harmonicas), Kristian Bugge (violin) and Morten Alfred Høirup (guitars and vocals). Already in July 2015, we did perform and teach at the great Festival of American Fiddle Tunes Festival in Port Townsend, Washington State, and in January 2016 we did a follow up-tour in the Pasicic North West, from Oregon to British Colombia. Now time is coming for a summer tour in the North West in June, and we just can’t wait. The tour will take us to Nisswa Stämman in Nisswa, Minnesota, and to Astoria Scandinavian Midsummer Festival in Oregon, but that’s not all. On our tour from the North to the North West, we’ll pass by Chrcago in Illinois, and I bet that we will visit another state or two, reaching Oregon. You can follow the development of the tour in the calendar of this site. Lydom, Bugge & Høirup do concerts as well as dances, the repertoire is traditional Danish music, and the audience is usually a broad mix of people with an interest in traditional music in general, and people with Scandinavian roots. 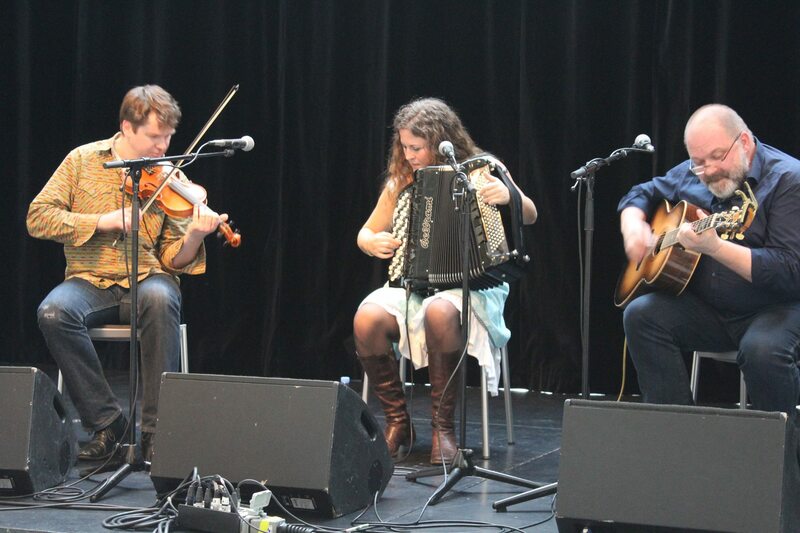 Later, in October, the trio will be going to Minot in North Dakota to perform and entertain at the huge event Norsk Høstfest, and in December we’ll be at Scan Fair in Oregon – but that’s another story. Here is a link to a video recorded in Seattle in januar 2016 – we are playing a set of traditional dance tunes from Sønderho on the little island of Fanø.